South Africa's uKhahlamba-Drakensberg National Park has been inhabited by mankind since the Middle Stone Age and boasts a number of historically significant sites with a number of examples of San Rock art. 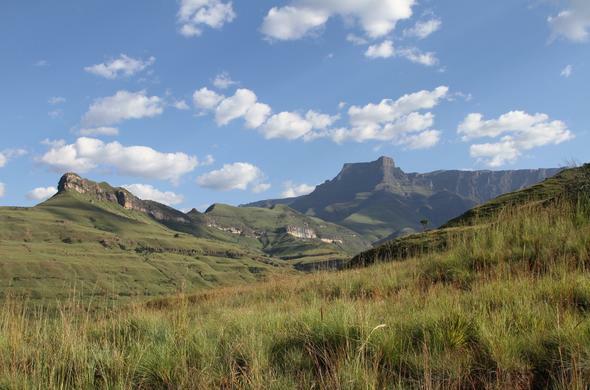 KwaZulu Natal's Drakensberg National Park is dominated by the jagged peaks of the mighty Drakensberg mountain range. One of South Africa's 8 World Heritage Sites, the Drakensberg National Park covers 250 000 hectares, starting in the north of the province at Cathedral Peak and curving southwards, clinging to the Lesotho border, all the way to Bushman's Nek. Known by the Zulu's as uKhahlamba which means 'Barrier of Spears' in Zulu and as Drakensberg or Dragon Mountain by the Dutch settlers, KwaZulu Natal's Drakensberg mountains are one of South Africa's most dramatic and beautiful natural landscapes. It is clear by the abundant artefacts found in the park that human beings have been living in the Drakensberg region since the Middle Stone Age, however; it is the ample examples of San rock art that have been best documented. Visitors to the National Park can take guided walks up to one of the many caves or rock over-hangs to view examples of these Later Stone Age people's art. Some of the artwork dates back to over 1 500 years ago while other examples are 'newer' depicting ox-wagons and men with rifles and cattle that have been dated back to around 800 years ago. The largest collection of these paintings is in the Ndedema Gorge that has around 4 000 paintings alone. The 35 000 to 40 000 examples of bushmen art found in and amongst the caves of the national park tell the story of the San bushmen living peacefully and in harmony with their environment. Sadly the arrival of the Nguni cattle farmers and in later years, the white settlers saw this tranquil co-existence being destroyed as the new white inhabitants hunted the wild game in the area and reduced the San's food resources. As was to be expected, tension increased when the San people began to use their new neighbour's cattle for food. Angered by the loss of their cattle, the white settlers began to view the San as vermin and shot at them, as they did other hunters in the area such as Baboons and Leopards. The San were thus forced up across the mountains and into Lesotho. Many of the San's escape routes where then blasted with dynamite to prevent them from returning to the area. Several military operations were started with the expressed objective of destroying the entire San race. As the violence continued the British colonial authorities set up a belt of black tribal reserves or 'native locations' in the foothills of the mountains to act as a buffer against the San. The last known rebellion by the San people in the area occurred in the early 1870s and was curbed by the British, forcing the remaining San people to flee to the Giant's Castle area.